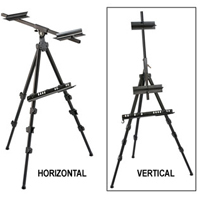 This highly adjustable easel is perfect for field use. It's made of lightweight and strong aluminum with a black finish and converts easily to a table top easel. It accomodates a 30 inch board and includes holders for paint brushes on the lower support as well as a carrying bag for convenience. Adjusts to work in a vertical OR horizontal position; perfect for watercolour/wet-media work. Comes with a zippered canvas carrying bag that makes transportation easy. 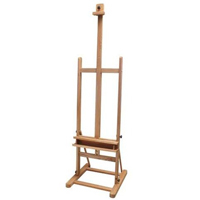 This highly adjustable easel is perfect for studio or field use. It has a black finish and can accomodate up to a 56 inch canvas or board. 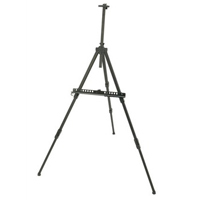 Its lightweight and strong aluminum construction converts easily to a table top easel. Three independently adjustable legs make it easy to set up on uneven terrain. Spring-loaded top support holds your canvas for added stability while you work. The canvas support includes paint brush holders and it comes with a carrying bag for convenience. This popular French style sketch box easel is made of beech with brass hardware and a leather handle. The sketch box easel will accommodate canvas sizes from 19" up to 35". Includes an 11" x 18" wood palette and a sturdy canvas carrying strap. The unique feature of a built in level also allows this classic easel to be positioned and levelled while outdoors on any terrain. This customer favourite holds canvases up to a 52 inches tall. It folds flat for easy storage and is suitable for painting while standing or sitting. 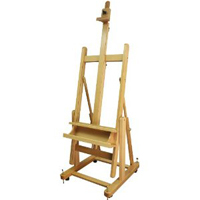 It's a great easel for oil or acrylic painting with minimal assembly required. Looking for a studio easel that will accommodate the mega-massive sizes of canvas sold on the market today? Look no further! Our "Mega H" frame easel will hold canvas sizes up to 84 inches tall! Sturdy, functional and a solid piece of furniture that will add stability to your studio. This Art Advantage H frame floor easel gives the painter a variety of custom settings for working while seated or standing. Folds flat for easy storage. Minimal assembly required. 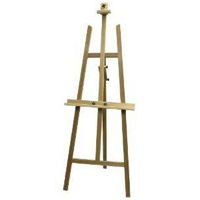 The Art Advantage H Frame Beech Studio Easel is a heavy duty studio easel. It has a forward tilt for pastel and portrait work and also goes completely flat for watercolour/wet media work. Large canvas holder/tool tray and spring loaded adjustment makes it the perfect easel for large works. Large 4 point knobs allow quick, accurate adjustments. Casters extend mobility while the locking system ensures the easel will stay in place! Holds canvases up to 90" in height.